Flowers That Last a Lifetime! No Green Thumb Necessary. Announcement Welcome to The Refined Gardener. 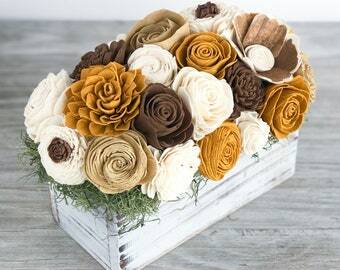 I love creating stunning and unique arrangements using wood flowers that last a lifetime! You no longer need a green thumb to make your beautiful bouquets and centerpieces last. In fact, these arrangements make the perfect gift that can be cherished for years to come. Want a coupon for 10% off your first order? Visit http://coupon.therefinedgardener.com! Welcome to The Refined Gardener. I love creating stunning and unique arrangements using wood flowers that last a lifetime! This item arrived today and is so absolutely perfect I can hardly wait to give it to one of my friends for her birthday. The materials used in developing this arrangement make for a wonderful artistic piece that looks so real. I can't wait to gift it! Thanks so much! I could not be happier with the custom floral centerpiece I received from TheRefinedGardener. Melissa was a joy to work with, very responsive in communication and super kind. The product arrived quickly, beautifully and professionally wrapped and in pristine condition. I wish I could give more than five stars! Now I’m off to go find more places in my house to decorate with wood flowers. Thank you Melissa!